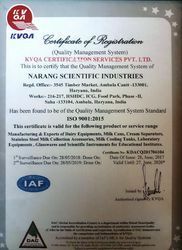 Incepted in the year 1954, we Narang Scientific Industries are manufacturing a world-class range of Aluminium Milk Cans, Cream Separator and Milk Buckets etc. To meet the needs of our huge client base, we are offering these products in various sizes, material, and designs. Our infrastructure is one of the main assets of our top-level success. Also, this comprises of various units like manufacturing, warehouse & packaging, quality control, marketing and administrative. With a purpose to mature into the biggest listed company of mat products, we are developing the norms and assisting the demands of a broad clientele. Our mentor Mr. Aman Narang facilitates communication through granting our team with his different industrial expertise. We understand his accomplished guidance that supports us to establish our brand competence.